Ever had one of those days where you plug away and plug away but still nothing goes right? And you know it’s your fault because it’s always your fault and you just know that it’s something you’re doing wrong and yet it isn’t! I had one of those, well two of those, if I’m honest, this week. On Tuesday I went to a sewing class because sewing machines and I don’t play nice together. I wish we did but we don’t. I thought if I went to a class we could make friends and cooperate. Hmmmmph! I spent four hours trying to sew a rail fence block with accurate 1/4″ seams. First it seemed that the problem was that the guide on my 1/4″ seam foot wasn’t flush against the foot. So my teacher kindly lent me a universal foot which was slightly better but not a huge improvement and the fabric ruffled as I sewed. The second more serious investigation involved changing the shank of the machine and using a foot made for another machine. This foot was acrylic which was nice because it was easier to see what was happening under the foot. It also had guides for 1/8″, 1/4″ and 5/8″. The perspex was staggered so it was easy to line up the edge of the fabric with the appropriate seam allowance. It worked well. I tried it and it worked for me. So it wasn’t me like it always is. Phew. Great result but would cost $48 for the shank and $36 for the foot. Ouch! So then I thought well what if I move the incorrect seam guide out of the way of my foot? We tried that and it sewed better but it still wasn’t 1/4″. What “engineer” and I use the term loosely “engineered” this piece of equipment and had the audacity to call it a 1/4″ foot? Then the kind lady in the sewing machine shop suggested I move the needle to the right one position. Great idea! Better result but not perfect. So perhaps move it two clicks to the right? Perfect! 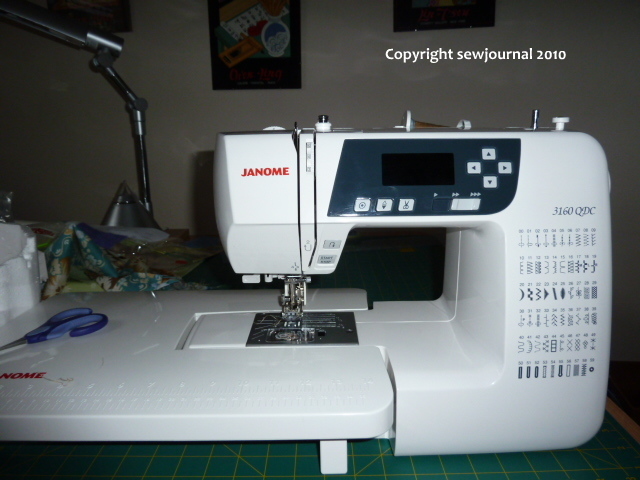 So now I can sew a 1/4″ seam as long as I remember to move the needle each time I switch on my machine as it resets itself when you switch it off. After all this drama and feeling like I was a hopeless case because I couldn’t sew a simple 1/4″ seam like any 12 year old can do I was feeling somewhat better. Then I read this wonderful blog post by Night Owl Sally and I feel totally vindicated! I’m not stupid, not uncoordinated, not at fault as always, it was THE MACHINE’S FAULT!